"So since this month is the Super Bowl and the start of the 6 Nations Rugby Tournament (and of course the continuance of hockey and football (or soccer!) season!) 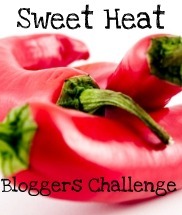 I decided the theme for this month's Sweet Heat challenge is.....(cue cheer leading squad!)..... Game Food! That means anything you fancy eating whilst watching a big game will work as long as it is spicy!" I really struggled with this one, as we are not a family who eat while watching TV, let alone while watching sport, we just don't watch sport! However, I had half a pack of streaky bacon left over from a previous recipe, so came up with the idea of making some savoury muffins. We ate them with soup, but they would be ideal for snacking on if you were inclined to watch 'a big game' on TV or even live as part of a picnic. 1. Heat the oven to 200C. Line the muffin tin with paper cases. 2. Measure the chilli sauce or relish, milk, oil and egg into a bowl and whisk until mixed, add the flour, baking powder, salt, cheese and bacon pieces and stir until the flour is just mixed, the mix shoudl still be lumpy. 3. Divide evenly between the cases. 4. Bake for 20 - 25 minutes until golden brown. When baked remove to a wire tray to cool. 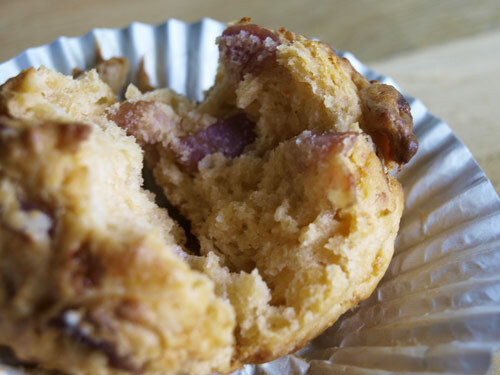 These muffins keep very well and can be revived by reheating for 20 seconds in the microwave. The chilli heat was kind of sneaked up on you just when you thought it was a plain cheese and bacon muffin. If you wanted more heat, just add more sauce and reduce the milk slightly. I love the idea of having them for a picnic as well. Great recipe! I really love savoury muffins, and these have THREE of my favourites in them - chilli, cheese and bacon. I mean HELLO! who wouldn't want to eat one of these! I am loving savoury muffins. This look so divine. I want you to come here right now and make them for me! Dom - would love to come round and make them for you but it's a little too far! You will just have to make them yourself. I've never made savoury muffins before but I just love the combination of cheese, chilli and bacon so these must be delicious! 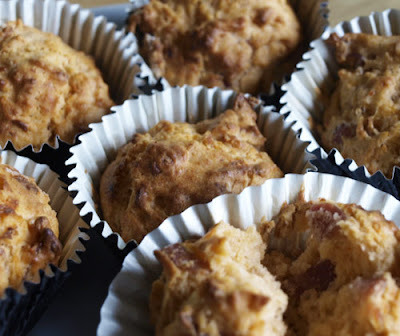 We love savoury muffins & yours look yummy! Love the combination of bacon & cheese even better with chilli! This is surely a winner!